Grameenphone is widely known as GP, is the leading telecommunications service provider in Bangladesh with more than 32 million subscribers (as of June 2011). 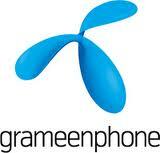 Grameenphone is the largest cellular operator in the country. It is a joint venture enterprise between Telenor and Grameen Telecom Corporation. Grameenphone has been recognized for building a quality network with the widest coverage across the country while offering innovative products and services and committed after-sales service.